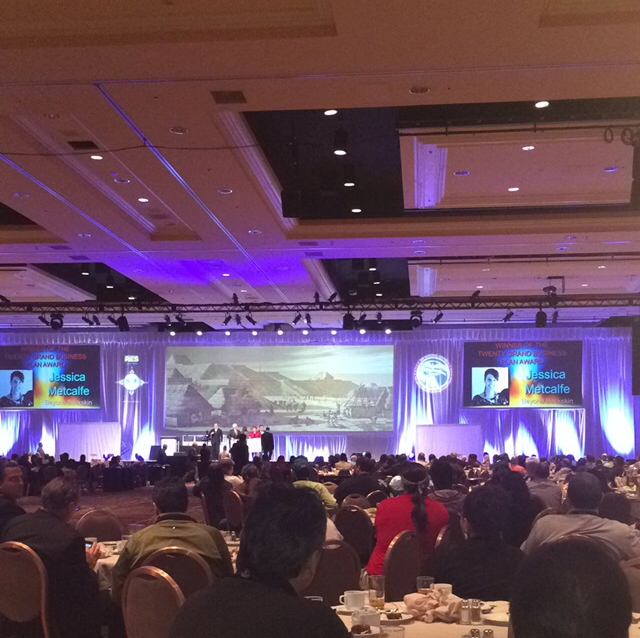 I had just arrived in Las Vegas for the 2014 Reservation Economic Summit. I was coming in from my homelands in North Dakota- a place now known for the oil boom. I was not there to promote the economic development of our natural resources, instead, I was there to promote the financial backing and support of our Indigenous creatives. When the oil has been sucked dry from Mother Earth, unfortunately / fortunately we will still be here (whether or not we will be with clean water is still up in the air), and after our leaders are done relishing the measly scraps thrown to us by big oil companies, our artists will still be creating. Maybe the porcupine quills will have an oil slick finish, and maybe the horse hair will glow in the dark. While we debate and discuss whether or not we can trust the latest environmental impact study, we can always trust our artists to tell some god-awful truth. While we can't depend on a 'good deal' with states for our casinos, we can depend on our artists to perpetuate cultural traditions and to carry our practices into the future. They are the ones who constantly and consistently visually (or musically) legitimize our claims that we are unique nations. Why RES doesn't support the arts more is baffling. Our artists have held strong leadership positions in the past (for example, in the Plains our warriors were artists and historians, documenting through pictorial imagery their feats in battle). And the beadwork, woven blankets, and wooden masks have held strong value in the past and still today. Where casinos or energy companies are absent, artists, as small businesses, bring economic development to some of our most remote and poorest reservation communities. 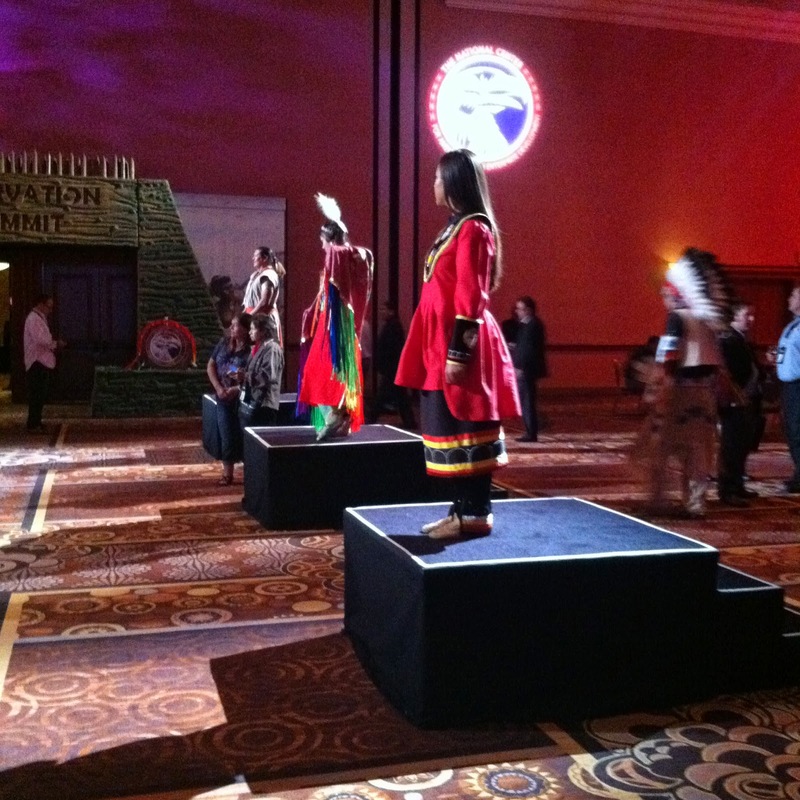 Last year at the annual Reservation Economic Summit, the Native artists who paid RES for a booth space were moved to the margins- down some long hallway, out of the way- so far out of the way, you wondered where you'd end up- Utah? Coming from an American business perspective, it made sense: make money off the booth fees, and end of deal. But not for the artists- many of them were greatly set back financially, and several artists chose not to come back this year. Why aren't we, as Native nations and business people, supporting and promoting our artists more? A recent study by the First Peoples Fund reports that nearly a third of Native people are practicing or potential artists. As working artists, they are also then considered small businesses. Why then do we not have more programs, funding sources, development resources, and outlets for these small businesses that will help them reach their full potential? And the potential is immense. On any given day, I work with about 50 artists who are creative and knowledgeable of their cultural heritages, yet most of them also create artwork under their label - Mea B'Fly, Virgil Ortiz Creations, DreLynn Design, OxDx, S.O.L.O., Gourd Jewels, and so on. These are small businesses. Those who create fashion find themselves in a funding abyss: art grants exclude fashion designers, and business competitions aren't artist-friendly and they require an emphasis on financial and marketing concepts. Beyond Buckskin happily fills this void. But there's only so much I can do by myself right now. Since the Boutique launched nearly 2 years ago, I immediately saw the potential to expand Native fashion as a field and to increase economic development on the local and ground level (and to do a whole bunch of other cool stuff, of course). I remember thinking, "Man, if only Beyond Buckskin could get a surge of capital, we could increase our on-site inventory, boost the artists' production, and reach more potential customers." So when I saw the announcement for the RES $20,000 Business Plan Competition, I knew it was exactly what Beyond Buckskin needed to reach our next level. I hit a ceiling of what I could do with the resources I had. I couldn't physically, or financially do more for Beyond Buckskin; I capped out. So I made it a goal to win it. I didn't say "If I won that money.." I said "When I win that money, I'm going to increase our inventory, update our technology, increase our advertising, and hire temp staff during busy periods." To enter the contest, I needed to submit Beyond Buckskin's full business plan. Up until a few months ago, BBB had a, how shall we say... chintzy business plan, a small one, a thin one. I had one, but it was by no means as robust as it needed to be to win. So I locked down and filled it out. Each section: the team, the product, the target market, the need, the marketing plan, the operations, the financials. When I saw the financials, I saw the weak spots, I saw the strengths, I saw the potential. I was so proud of this 64 page document. But I'm not a trained businessperson, so I asked for help and feedback from my college friend James Valadez. His set of eyes helped translate my vision into the language of the business world. I'm an academic, a creative, a humanitarian, an activist; I'm aware of who I am, and where and when I need assistance, and James helped immensely with this. Talking with him through parts helped me to understand concepts like an ROI. I also audited an Entrepreneurship class offered through my alma mater, Dartmouth, and their Tuck School of Business. I audited this class in the evenings in my nonexistent 'spare' time. Through this class I learned how to build a strong plan, and how to do a great pitch. I got to watch actual business pitches. I learned where they sparkled, and where they faltered. I whittled down my pitch to 2 minutes, and I said it over and over again, in front of the mirror, while I was taking out my contacts, pouring a glass of water, I think I even said it in my sleep. When it came time to do the pitch - the make or break moment of whether or not you would advance - I was overly prepared. I was ready. I just needed to make sure there was nothing in my teeth. The judges threw a curve ball, but it didn't matter, I could do my pitch while putting on my mascara and letting the dog out to pee. I had to win, or Beyond Buckskin wouldn't be able to continue to grow, and this would impact dozens of artists. Losing wasn't an option. During the pitches, the contestants shared a side room where we sat and waited. In this side room, I got to meet and learn about other cool projects. I grew particularly fond of two young entrepreneurs from Winnipeg. Dee Thomas-Hart just launched a youth-centered website Kanata of Youth, and Kelly Topolino Edwards had the coolest idea to build a potentially highly-profitable boutique hotel. Among the others, Brenna Chee recently launched her line of bath and body products, and Wendi Lewis was launching a running apparel company called StrongOnes. A highly-motivated group of students from New Mexico State and their advisor were the runners up with their idea to help artists through micro loans and connecting them with buyers. The experience was invaluable. 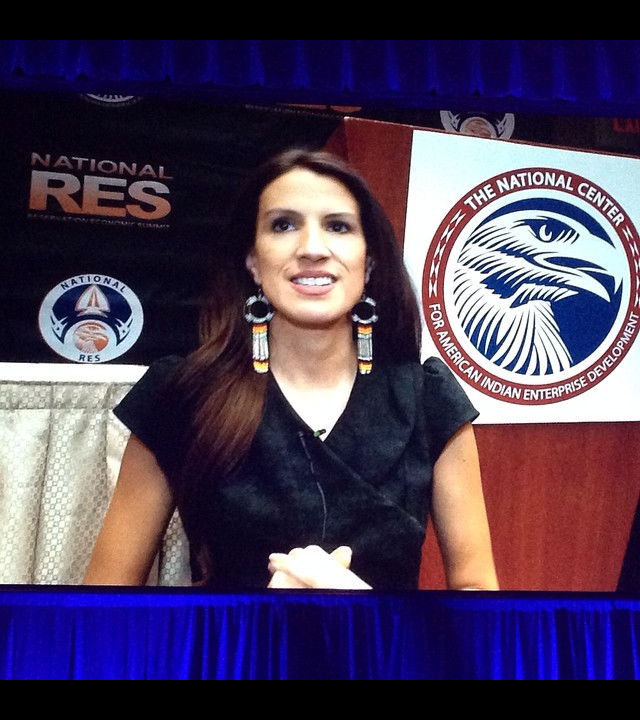 While most of the RES attendees are tribal leaders and established business people, our group represented an important demographic: the Native people out there who have creative ideas to strengthen the well-being of our communities through new and exciting business ventures. It was energizing to see the eyes of these young entrepreneurs light up as they talked about their business ideas, and it was crushing to see their doubts and insecurities come out after their constructive feedback from the judges. When we start a business, we are usually taking a big risk by investing the start-up with our own savings, and putting in countless hours of our lives that will never be returned. Through my Entrepreneurship class, I learned that not everyone will think your idea is good, not everyone will coo over your business plan. In fact, you'll probably get a lot of kick-back, criticism, deterrents, and so on. Try to take criticisms as opportunities to learn and grow, or, if they're just Negative Nancys, forget them and forge ahead. 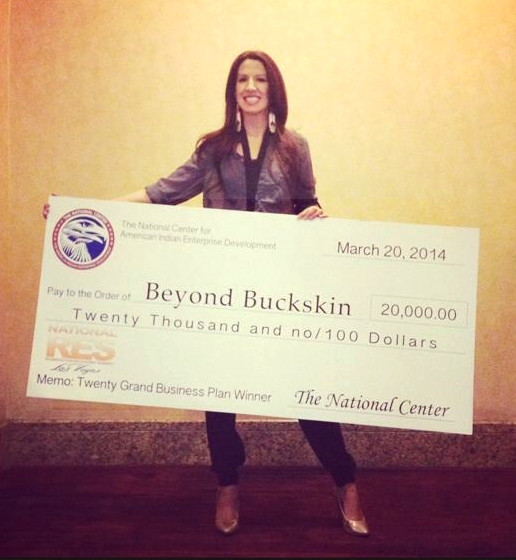 In the end, after two days of waiting, and an additional 2 grueling hours of having to sit through an entire luncheon before announcing the winner, my heart nearly jumped out of my chest when they announced Beyond Buckskin as the winner of the $20,000 Business Plan Competition. I had to hold my heart as I walked up to the stage so it wouldn't fly away. I owe a huge thank you to the Reservation Economic Summit board and the contest judges and sponsors. You can expect this money to be used in the best way possible to advance this business so that Beyond Buckskin can continue to promote and provide opportunities for Native American artists and designers now (and in spaces like RES) and in the future. I want what we are doing now to be felt and known 50 years from now. This is my next goal, so expect a nice next phase of growth for dear old Beyond Buckskin. Gitchi-migwetch to everyone (the designers, customers, journalists, relatives, fans, and everyone else) who supported us in the beginning and who continues to support us now- Beyond Buckskin is nothing without this vital support.